Examines the history, geography, and economy of the fruit market in the contemporary global scene, and reflects on how this phenomenon has shaped cultural identities. Bitter Bites: Tracing the Fruit Market in the Global South examines the history, geography, and economy of the fruit market in the contemporary global scene, and reflects on how this phenomenon has shaped cultural identities. Fruits, both nature’s bounty and a man-cultivated good, are the epitome of today’s neocolonial dependencies, especially in relation to excessive consumerism. 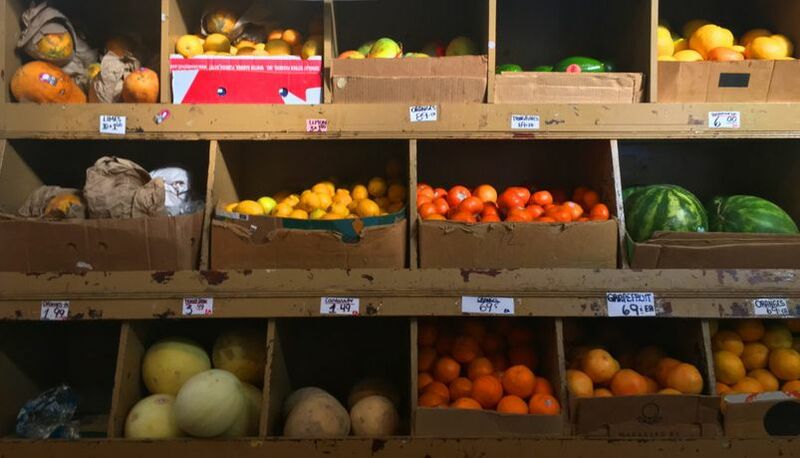 The insistence for cheap produce year-round has reinforced and exacerbated the divide between “first world” and “third world” and how consumers rarely understand that our cheap bodega fruits are the result of these colonial based economies. Often regarded as an exotic commodity, fruits have been considered a symbol of the ‘Other,’ a metaphorical representation of the people who harvest the fields, created by those who demand the land’s products. This exhibition addresses a series of global networks and everyday experience concerns that approach the topic from different perspectives, mediums, and visual languages through the work of three artists: Daniel Santiago Salguero, Claudia Claremi and Raja’a Kahlid. The fruit market is often under recognized today, yet it is also highly visible. In New York City, for instance, one can find fruit carts on almost every street corner regardless of the differing character, ethnicity and socioeconomic makeup of each borough. Yet, how these crops manage to reach our tables is often unknown to most consumers. According to a recent New York Times article, 20 million bananas are distributed around New York City each week, coming mostly from Ecuador. Not only is the global environmental footprint of such consumerist phenomenon dramatic, but it also transforms the local landscapes, social structures, and even traditions, of the fruit supplier communities abroad. Moreover, these inequitable power relations also trigger sexist, racist, and classist (mis)representations of those living in the world’s warmest regions —- think of Carmen Miranda’s popular ad for Chiquita Banana. Bitter Bites: Tracing the Fruit Market in the Global South reveals the economic, political, and cultural implications of the fruit trade today. The show has a transnational scope that mirrors that of the global fruit market, including artists from Bogotá, Madrid, and Dubai, whose works navigate myriad contexts ranging from Southeast Asia to the Americas. The pieces in this exhibition present and interrogate the problems of the fruit market in both the domestic space and the public sphere, surveying the evolving shape of this reality, beginning in the colonial times until today. Fruits Tunnel, a site-specific installation created by Colombian artist Daniel Santiago Salguero, is comprised of the accordion-shaped assemblage of different brightly coloured papers with abstract cut-out spaces throughout their centers. Salguero metaphorically compares the journey that millions of migrants undergo in order to enter the United States with the most common routes of fruit transport: from South to North, and from East to West. While the migrants’ experience is usually performed clandestinely, the fruits itinerary is explicitly shown here in the brightly coloured paper. In The Memory of Fruits, Cuban-Spanish artist Claudia Claremi creates an unorthodox archive of ‘forgotten’ fruits from Puerto Rico. She gathers the testimonies of several “San Juaneros” in order to recuperate the memory of local fruits that are no longer cultivated in Puerto Rico in favor of those preferred by the international import and export market. In this work, not only does the artist call attention to contemporary manifestations of economic, territorial, and cultural colonialism but she also restores part of the collective identity of Puerto Ricans, as these fruits are, literally, part of their memories. In Mango Story, a new work by Raja’a Khalid, the Emirati artist reflects on the history of mangoes as an emblem of ‘soft power,’ and on their use as a diplomatic gift in the international relations between Southeast Asia, the United Kingdom, and the United States. Establishing a parallel between diplomatic gestures and branded corporate gifts, the artist has created a series of mango-shaped paperweights in which the tenderness of the fruit imagery contrasts with the implacable rigidity of the office supply. Bitter Bites: Tracing the Fruit Market in the Global South illuminates how international exchanges involving fruit today, either in the form of diplomatic gifts or as products of the year-long demand for tropical fruits in cold climates, reproduce worldviews arising at the origins of Western modernity that continue to jeopardize the ways of life of the so-called Other.